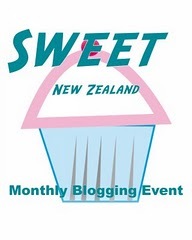 This month I hosted my first blogging event for Sweet New Zealand. Thanks go to Sue over at Couscous and Consciousness for the linky thing, yes it is actually called link thing, that makes entering so easy. So much sweet inspiration and quite a few new to me Kiwi food blogs...great to see that out little community is growing. In the order the arrived I give you the November round up of Sweet New Zealand. The first entry for this month comes from the lovely Alessandra, the creator of Sweet New Zealand. How to make your own marizpan and to create these pretty as a picture little morsels from her book Sweet As. 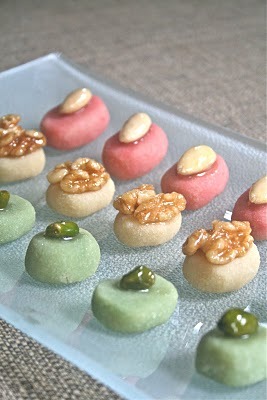 These pretty little treats would be perfect for Christmas and they are even vegan and gluten free! Next up Little Gluten Free Mango Cakes from Emma over at My Darling Lemon Thyme. An Kiwi, now living across the ditch where I am very envious of the abundance of beautiful mangoes. And what's not to love about these little cakes? 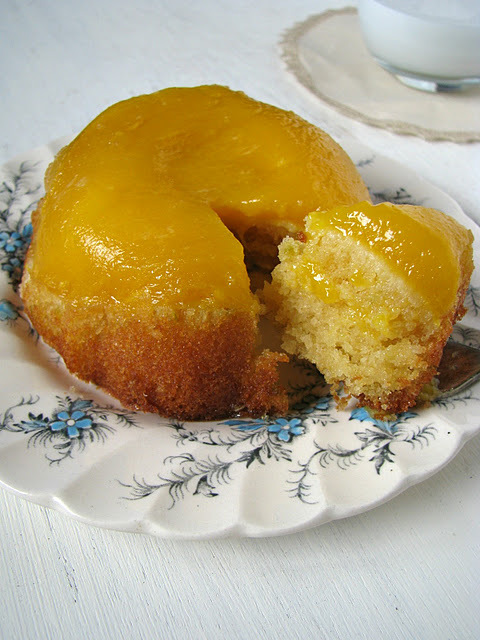 Light sponge topped with mango and a tangy lime syrup sounds like my kind of dessert. One thing that have found I like about hosting this little event, over and above all the tempting sweet treats, is coming across new blogs. These tasty looking Luscious Lemon Slices come from After Taste, a new to me blog and like me Bridget is a lemon fan. Lemons just make everything brighter and just look how bright and vibrant these slices look, they are definitely luscious and most definitely on the to do list. Another new blog to me is High Tea with Dragons and straight off I love the whimsical name and that's before we get to some seriously pretty cup cakes. Tea and cake are one of life's simple pleasures and Kirsten has brought them together in her beautiful Tea Infused Cup Cakes. 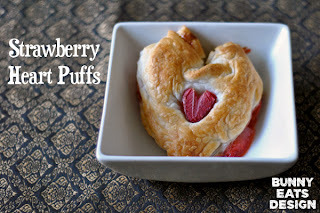 It is strawberry season in NZ and I agree with Bunny Eats Design that cooking them makes them all the sweeter and more fragrant and then why not make them in to a Strawberry Heart Puff? Flaky puff pastry, ginger and fejoa jam and fresh strawberries....sounds like a delectable sweet treat to me. Pear and dark chocolate....need I say more? 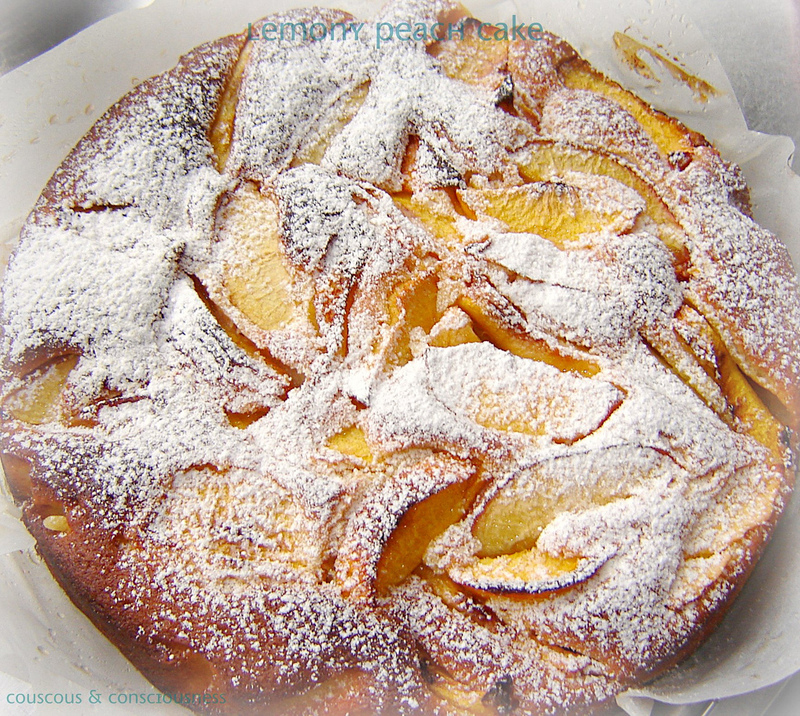 This is another tempting entry from Alessandra; Pear and Chocolate Cupcakes. These are even more decadent topped with meringue baked pears and dark chocolate! Yes you heard right meringue bake pears....how good do they sound?? 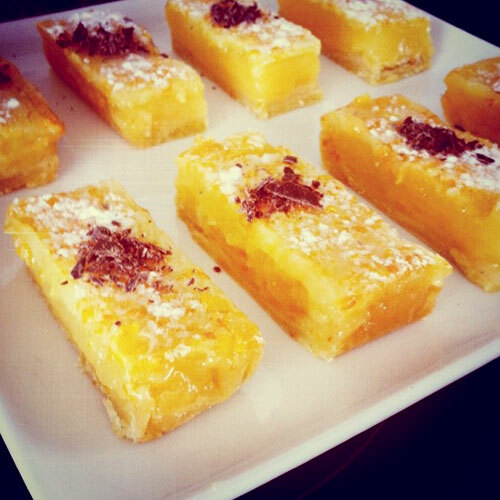 And another from Alessandra with Vegan Sweet Bites over at Vegan Recipes....little morsels of mango pudding, these could surely count as one of your 5+ a day?? The next entry is pretty as a picture, as always such pretty picture from @downunder. This time Vanilia Kifli, or in English, Hungarian Walnut Biscuits. 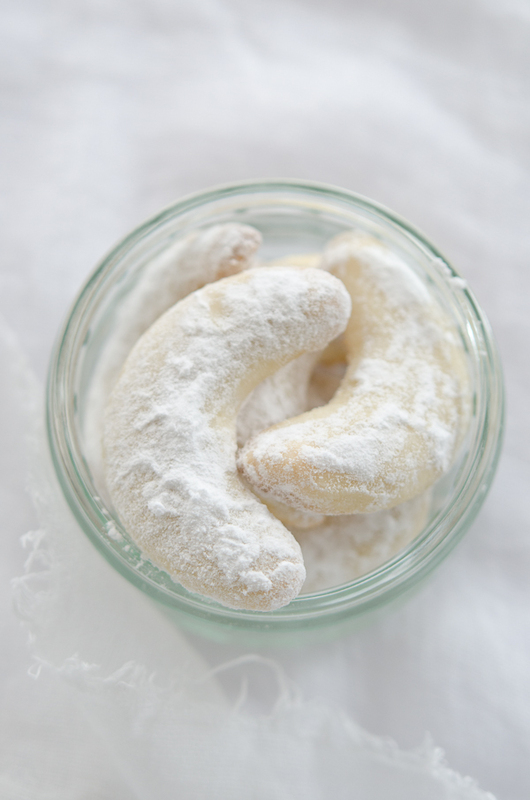 These are the perfect festive treat for the holidays; crescent shaped cookies dusted with snowstorm of icing sugar. And then from another new to me blog is Privish' Killer on the Plate where she has been celebrating the arrival of strawberries with some Strawberry Ice Cream. Homemade ice cream, now there is not much that beats that, especially on a hot summer's day. Wow....is the only first reaction to this amazing Chocolate Tuxedo Cake from The Antipodean Parisenne. A Kiwi food blogger, Felcity, in Paris has found us! And I am in agreement that this would be perfect for Christmas especially as I am not really a fan of the traditional Christmas Cake. 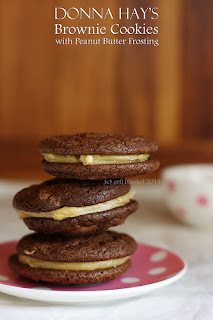 And now for some seriously decadent chcocolate with these Brownie Cookies from Arfi over at Homemades. I can attest that these are amazing, as I was lucky enough to be down Onewhero way for a spot of morning tea with Arfi and I got to sample them first hand. So incredibly chocolatey...if you like chocolate you will love these. Here is more festive inspiration and another sweet treat that would make for a lovely homemade Christmas gift. 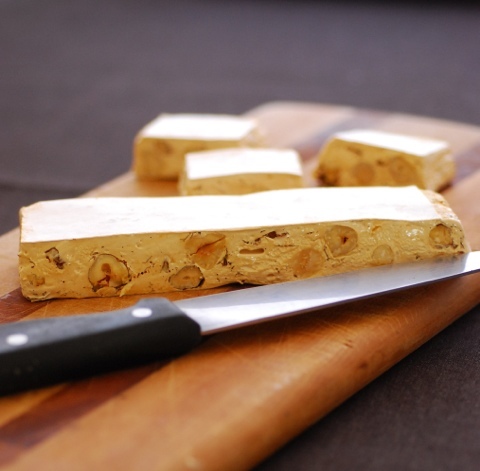 As always Alli over at Pease Pudding adds her own little exotic twist, this time Hazelnut and Orange Blossom Nougat. Chewy nougat flecked with toasty roasted hazelnuts and the exotic supplied by a little orange blossom water. From Bron in Christchurch we continue with the festive theme with Christmas Tea Panna Cotta with Cranberry Gelee. Creamy panna cotta and a fruity gelee...delicious. The perfect dessert for Christmas Day, especially if like me you are not a fan of Christmas Cake or Christmas Pudding. 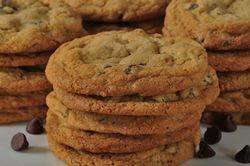 And then there are these Chocolate Chip Cookies from Christina over at Gninwordon. I confess I have been lucky enough to taste Christina's cookies as I was on the receiving end of some chocolate peanut butter cookies when she came to stay for our NZ Food Bloggers Conference and I can attest they were heavenly. If these are half as good as those then they can only be quite amazing. 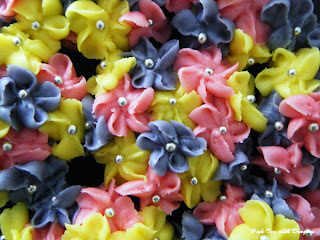 More cookies just in from Shirleen over at Sugar & Spice...and all things nice. This time addictive looking Coffee Snaps. Crunchy on the outside and chewy in the middle, perfect with a cuppa. They'll keep....but will they last?? 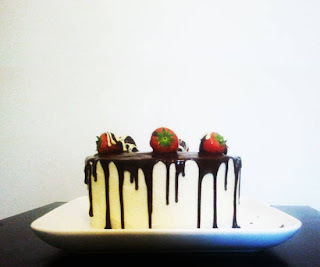 Yet another new blog to me...Baking Makes Things Better. It is fantastic to find all these new food bloggers. 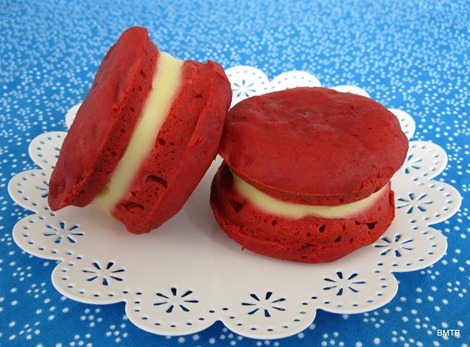 Melissa and Courtney are in Auckland and love to bake and just check out these Red Velvet Whoopie Pies...it doesn't get much more festive than these. 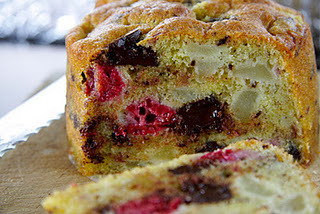 How good does Raspberry, Pear and Chocolate Loaf sound? This comes from Lesley at Eat, etc. Think warm loaf just out the oven, dark chocolate melted and still warm, raspberries interspersed with pear, two of dark chocolates best friends all wrapped in one delicious sounding loaf. Well hello! The final entry for this month certainly won't dissapoint and I think only appropriate to end on such a decadent not - Kahlua and Mars Bar Cheesecake! 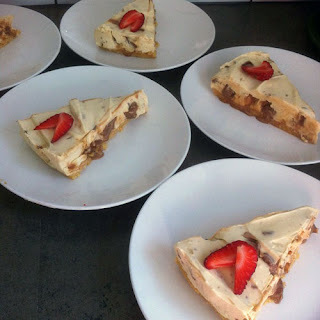 This is the second entry from Bridget over at After Taste and they would make for the perfect decadent and indulgent treat. If not decadent enough top with crumble Cadbury Flake! And that marks another month of Sweet NZ. So much sweet inspiration. Without further ado I will pass you on to December's host Bron. Happy sweet concocting everyone! Sweet and tempting round up ! This is just amazing. More new recipes to bookmark, more new blogs to read and more fellow Kiwi bloggers to get to know! Yay for another month of sweet, sweet Sweet New Zealand! wowowowow I see a lot of things that I could eat right now!! Thank you for hosting Mairi, this is a great roundup, and yes, fantastic way to get to know more NZ blogs :-). Some amazing sweet things this month and a thoughtful summing-up from you Mairi. Interesting to see some more Kiwi blogs too. Thanks Mairi. Argh, sorry I missed out contributing to November, but plenty of eye candy here, particularly interested in the nougat... I'll make sure to add to December's Sweet NZ. @Vanille I know, I seem so many new kiwi food bloggers....our little community is growing! @Emma Galloway @ my darling lemon thyme Thanks Emma, it was fun! So many sweet treats I want to try! @Alessandra Thanks Alessandra and for your multiple entries!! @Bake Club Thanks for stopping by & look forward to your December entry. @peasepudding Thanks Alli, definitely craving the sweet stuff now. @Plum Kitchen Yes a very impressive line up!